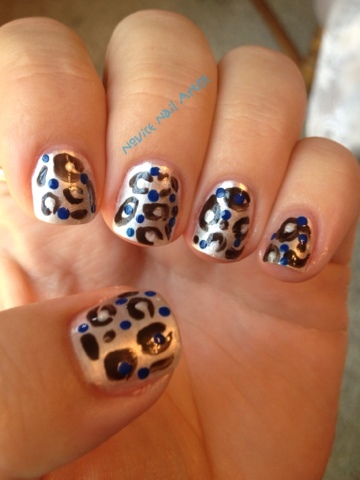 For this mani, I decided to try out my new China Glaze. It seems a perfect shade for the medal ribbons for this years Olympics. On my thumb is China Glaze in Coconut Kiss - it's such a fabulous shimmery purple, I couldn't turn it down. Bronze for my ring finger with 1 coat of CG Mahogany Magic from the Hunger Games Collection and a lovely coat of Essence Color & Go Gold Fever. I was surprised at this polish, it does have lovely flecks of gold in it, but has the perfect hint of red flecks that worked so well with the MM. Pinkie is dressed again in CG Coconut Kiss. 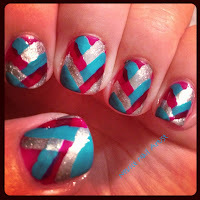 I was pretty pleased with this mani, although I definatly need to work on the half moon free hand. Hope you see your team wearing one of these at the games in 2012! Holy cow I was like a little kid at Christmas, my packages couldn't get here fast enough! Cathy send my Zoya super fast and I got it in about a week from when I purchased it. Harri was on vacation when I bought the China Glaze but it's shipped now and I'm impatiently tapping my fingers for it! Zoya Moxie is just amazing it's a beautiful berry color and the formula is so smooth and applies so well! 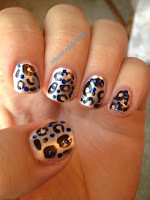 I only needed 2 coats to get opacity on my mani. I'm totally in love with Zoya so far! I've seen several swatches from the different collections with the other bloggers I follow and cannot wait to get my hands on some more! Weeelllll this one didn't turn out quite as I had it in my head. What I had planned was to do all the colors of the rings in order, then do rings in opposite colors, with a star burst in the middle. Ugh, well, lesson learned. Sally Hanson Insta-Dry in Bye Blue on my thumb, stamped with SE - 20 in Sinful Colors Tokyo Pearl and I did the ring in NYC Long Lasting in Big Apple Red, pointer finger in Sally Hanson in Mellow Yellow and the ring in New York Color in High Lime Green, NYC in Black Lace for the middle finger and since I couldn't do black over black, I used Sinful Colors in Tokyo Pearl. 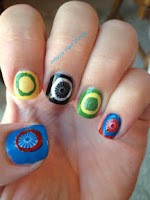 My ring finger is in NYC High Lime Green with Mellow Yellow and my pinkie in NYC Big Apple Red with the Bye Blue ring. Oh well, not the best, but defiantly not my worst! There is so much history behind the Olympics - it's an amazing tradition originating from Greece, with recorded games dating 776 B.C. The first event was running - a cook named Coroebus ran 192 meters (naked) and won, making him the first Olympic Champion. What a long ways the events have come now! This mani bears two flags - USA and Australia. 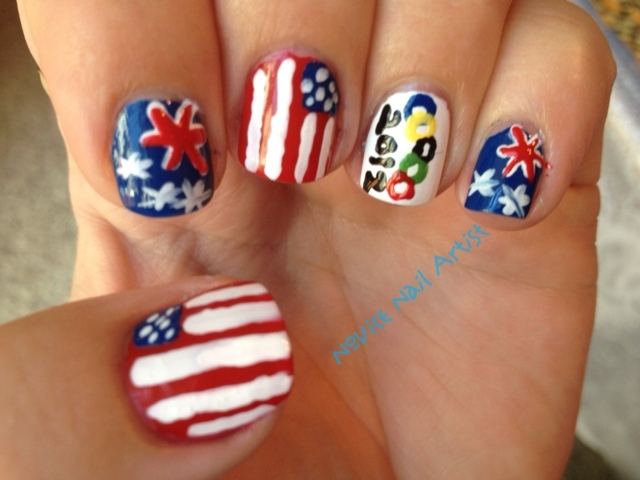 My mother is Australian, and I love my family there deeply, so there's no way I could do an Olympic Flag mani without both. I'm pretty excited at how it turned out too! Pointer and pinky finger are Pure Ice French Kiss, with NYC in French Tip, for the stars and star base, with NYC Big Apple Red for the jack. 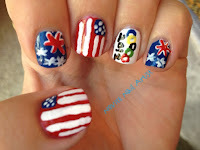 Check out the other Olympic mani Champions! Sooooo for my Day at the Zoo mani, I remembered that they have snow leopard cubs at the zoo in Point Defiance. I pulled a few pictures online about them and found that some of the cubs have bluish eyes when they are born. For the base, I applied 2 coats of Sinful Colors in Tokyo Pearl, then free hand the spots in NYC Long Wearing in Black Lace Creme and dotted with Pure Ice in French Kiss. 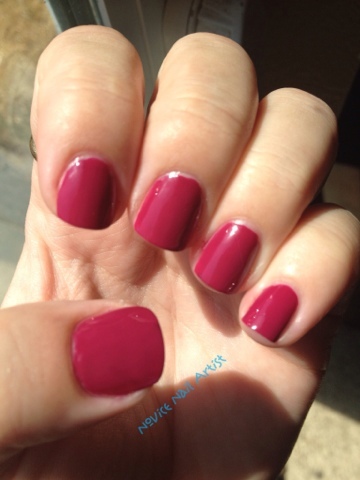 Topped it all off with a coat of Seche Vite. 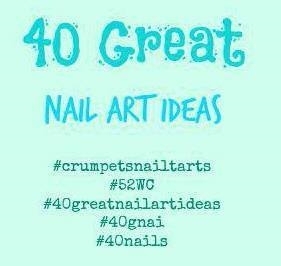 Check out the other bloggers amazing art work. Ugh so late, so very very late on this one. I didn't even bother to post it on the Purple Crumpet Fairy Challenge on Facebook. I'm still trying to get the grove of taping for different effects. Ultimately I think that I'm just impatient and begin to tape to quickly. Any tips are most welcome! Thanks for checking my blog out. 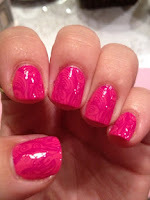 Today's mani is pink, pink, pink, and I'm proud of it! 2 coats of NYC Long Wearing in Pink Promenade Creme and I stamped it in Sinful Colors Dream On and topped it off with a coat of Seche Vite. 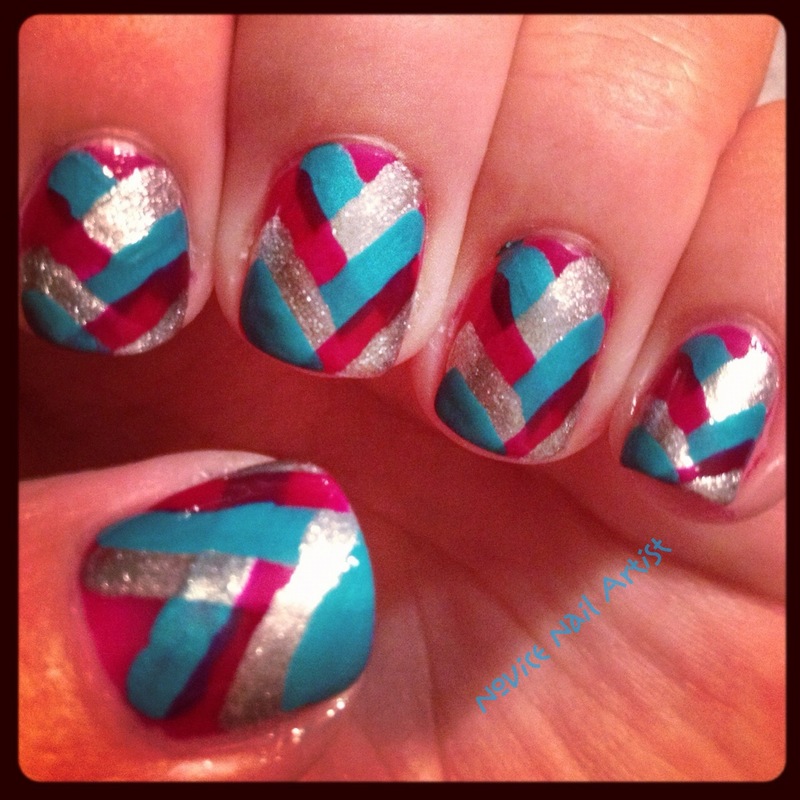 iHeart Pretty Polish 100 Follower Giveaway! 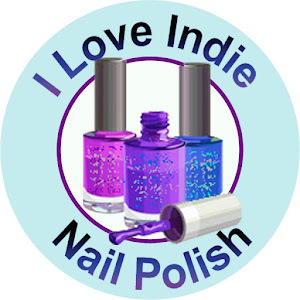 Awesome awesome indi nail polish giveaway! Yes, you read the title correctly! 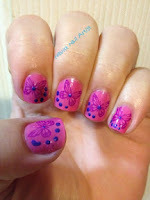 Today I got inspiration for my MSMD mani from Ashley on my Facebook Purple Crumpet Fairy Challenge. She's amazing! 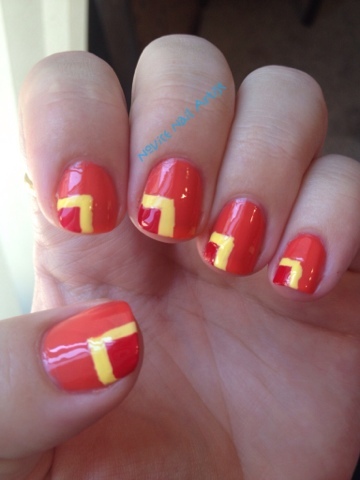 This is her original mani. And here is mine! My colours were Wet n Wild Fast Dry in Silvivor, L.A. 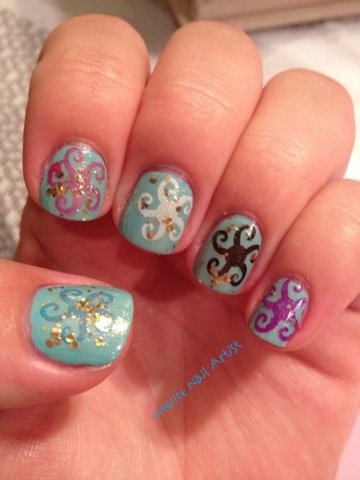 Colors in Fiji Purple and China Glaze in Turned Up Turquoise. For my first one, I was pretty excited how it turned out! 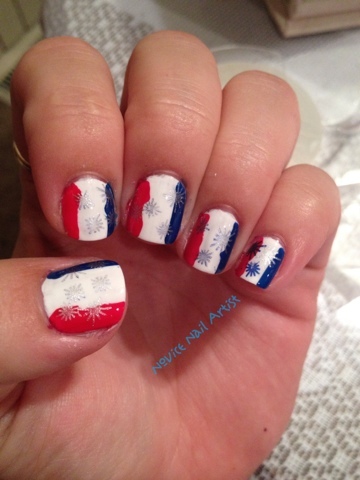 I started with 2 coats of NYC Long Wearing in French White Tip, then used Big Apple Red and Pure Ice French Kiss to make the French flag. Then I stamped with Wet n Wild Fast Dry in Silvivor the little starburst for fireworks. Topped it off with a coat of Seche Vite. From Thumb to Pinkie: Stamped with Sinful Colors in Savage; Sinful Colours Nail Art in A Slice To Go; Fllirt Stamping Polish in White; Essence Nail Art Stamping Polish in Stamp Me Black; and Sinful Colors in Dream On. 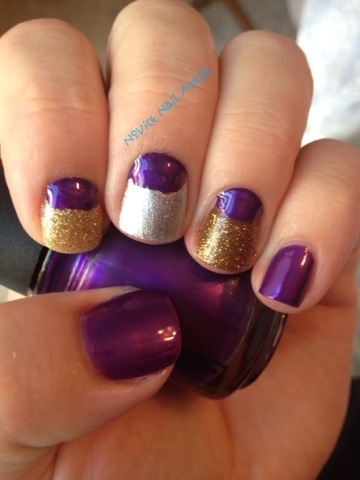 I used Essence Color & Go in Make It Golden glitter over the top. Don't forget to check out the amazing participants of the Purple Crumpet Fairy Challenge! Started with 2 coats of Sinful Colors in Bianca - I love this colour, it's feminine/girly pink but sophisticated. I should have taken a photo of it before I stamped, but I will swatch it again for another post. Don't forget to check out the other ladies blogs/pictures that are doing the challenge as well. Happy Wednesday!